From my hometown in Laguna Beach, California, I offer in-person and cyber essay workshops to students throughout the world. I also offer workshops to teachers, college admissions consultants, high school counselors and educational consultants. During my interactive essay workshops with students, I help them understand what makes a great college application essay, and take them through various writing exercises to help them identify strong topics, teach them narrative writing techniques and show them how to craft “slice-of-life” personal essays. Use powerful writing techniques to power their essays, including anecdotes, dialogue, sensory details, etc. I can also customize workshops on different topics, such as how to use powerful writing techniques, such as anecdotes; how to write University of California essays; how to write most popular supplemental essays; how to write transfer essays; how to bump up, self-edit and polish essay drafts; etc. Anyone is welcome to put together their own group, including educational consultants, counselors, teachers, parents and students. We work together in my home or via Skype/Facetime. Email me–Janine Robinson–for details: EssayHell@gmail.com. If you want to put together your own group for a workshop, I host them at my home in Laguna Beach or a location you pick in Southern California, from LA to San Diego and Riverside. Email me to discuss details: EssayHell@gmail.com. 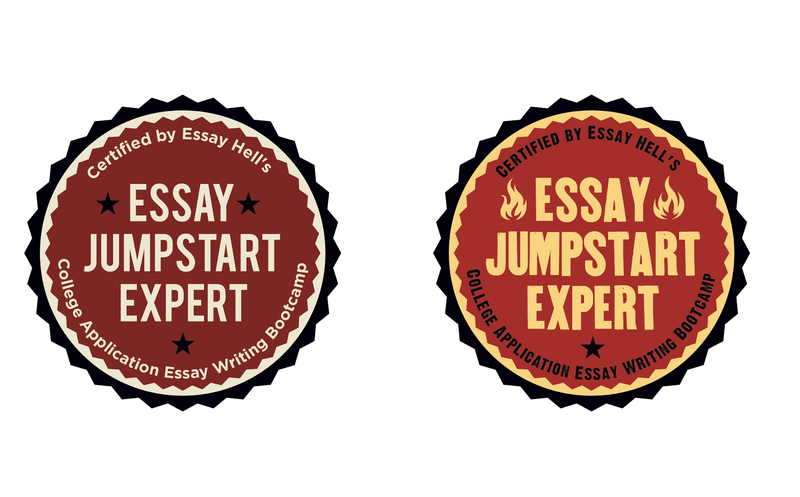 Become an official Essay Jumpstart Expert! Get certified to teach narrative essay writing by taking my private or group workshops either in person or via Webinar platforms. Cost: $200 for hourlong private training. Put together you own group of 2 or more (cyber or in-person), and the per-person cost goes down! Just email me for details: EssayHell@gmail.com. During these sessions, I teach counselors, tutors and English teachers what I believe makes a “great” or effective college application essay, and then how to teach their students to write them using a narrative (story-telling) style to showcase their defining qualities and values. In effect, I share my main essay writing Show AND Tell “method,” including how I help students brainstorm and identify engaging topics, use anecdotes (mini real-life stories) to hook readers and make their essays personal and meaningful, and a slew of other tips and techniques to craft powerful personal essays. Participants receive copies of my trade-marked handouts and worksheets (my SampleOutline™, AnecdoteBuilder™, Sample Essays, ProblemFinder™), access to my online writing course and a certificate of completion and a digital badge (two options) to use for marketing. They also receive digital versions of my popular writing guides, Escape Essay Hell! and Heavenly Essays. Read what Essay Jumpstart Experts have to say about Janine and her essay writing training. Square One Counseling, Laguna Beach, CA: I have given essay writing workshops to the clients of Lynn Fair, a top college counselor in Laguna Beach, CA. Summer 2013-2016. Palisade High School, Palisade, CO: I gave essay writing workshops to the IB students as part of a college admissions seminar. Summer 2015. Texas Region One GEAR UP, Edinburg, TX: I conducted weeklong essay writing workshops to the top 160 students, and 35 English teachers, from 30 high schools in the Rio Grande Valley. (Read more about these workshops HERE.) GEARUP also purchased licenses to my online essay writing course for 10,500 students. Spring and Fall 2014-2017. Colorado Academy, Denver, CO: Daylong workshop to about 100 rising seniors on how to brainstorm, craft and edit their Common Application essays. Summer 2017. Girls, Inc. of Orange County: Gave essay writing workshops to freshmen and sophomore girls at their annual Eureka! Camp summer program at Orange Coast College in Costa Mesa, CA. Summer 2017. City of Laguna Beach: I gave weekend college application essay writing workshops through the city’s Recreation Department at the City Community Center downtown. Summer 2017. Shanghai International School: Spent a week giving essay writing workshops to 380 juniors from SAS at a college admissions retreat in beautiful Hangzhou, China. Spring 2018. Click HERE to contact me any time. PAYMENT: All clients must pay in advance of my services (below), and then as they go for editing help. NOTE: Please do not make payments until we have discussed and confirmed the exact services I will be providing. Just email me any questions at: EssayHell@Gmail.com. Thanks! (Click “Buy Now” button below): For Hourlong Jumpstart or Combo Jumpstart/Editingsession. (Click “Buy Now” button below): For one round of edits on a core essay or edits on 2-3 supplemental essays. (Click “Buy Now” button below): For overnight editing. (Click “Buy Now” button below): For additional charge to add onto $100 or $200 payments (such as $150 for 2-day editing turn-a-round) or other discussed fees.